Why Buy a Ranger Design Van Ladder Rack for Your Commercial Vehicle? Our newest ladder rack, the Max Rack is now available for your van. Van ladder racks help tradesmen overcome some big challenges to their day to day operations. A well designed rack can offer many advantages to the tradesman beyond just loading and transporting a ladder. At Ranger Design, we have a number of different styles of racks that can help tradesmen free up valuable interior cargo space while helping them work more effectively and safely. 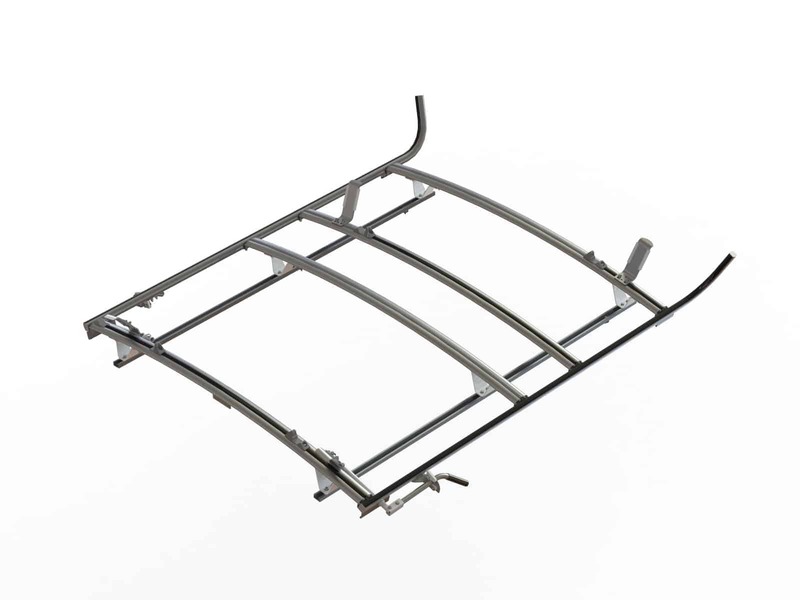 All of our van ladder racks are made of heavy-duty aluminum and are contractor proven tough. They work hard and pay for themselves by helping tradesmen save time and money. All Ranger Design van ladder racks mount to the roof of a van and allow the ladder(s) to be safely stored and transported on the roof. This frees up valuable interior space giving you more cargo capacity for transporting more equipment and materials. Nobody likes to lose time and money due to injury. A van ladder rack can reduce the risk of injury making it much safer to load and unload a heavy awkward ladder. Once stowed up and out of the way, it is safely secured for transport around town and out on the highway. Wasting time wrestling with a heavy ladder costs you money. 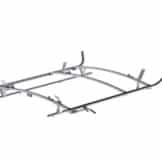 Our van ladder racks are designed for simple one person operation. By making it much easier and quicker to load and unload a ladder, you save time. Repeat this process many times and day and it’s easy to see how our van ladder racks help you work more effectively. Ladders and commercial vehicles are expensive. 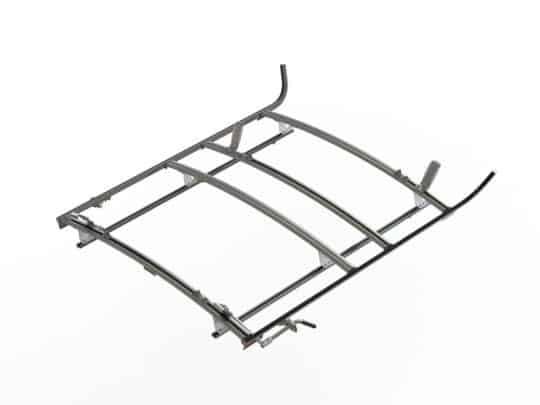 Having to replace a damaged ladder or repairing vehicle bodywork adds to the costs of operating your business. 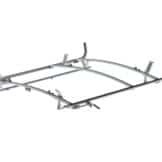 You can protect both a ladder from damage and your vehicle’s exterior finish from dents and scratches with a well designed rack. Military grade aluminum extrusion, high density plastic and stainless steel components ensure no corrosion over the lifetime of the rack. No metal contact to ladder, leading to longer life of ladders with less chance of fiberglass splinters. Aerodynamic design with minimal wind noise. In order to choose the best rack for your needs, it’s best to ask yourself a few questions. What do you need to transport on a daily basis? Do you need to carry a stepladder? Do you need to transport one or two different size extension ladders? Do you need to have materials like conduit or tubing stored on the rack as well? By answering these questions you’ll have a better understanding of which style will work best for you. 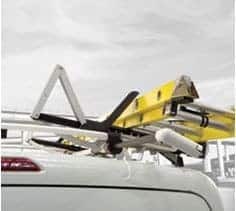 Drop Down – Max Rack for high-roofed vans lowers the ladder up to 50 inches with gas shock assistance, eliminating the need to reach up. 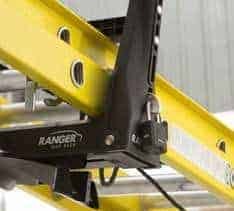 Ranger Design’s new gas shock assisted drop down mechanism is the safest choice in ladder racks for vans. 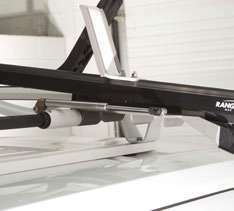 Unique with its REVOLUTIONARY SINGLE MOTION OPERATION, it is proving to be the fastest, safest, & toughest drop down ladder rack for vans available. This patent-pending system is now available. Learn More. 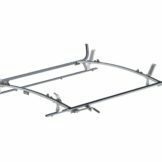 This new rack is now available for the following vans: Ford Transit, the Mercedes Sprinter, the Nissan NV and the Ram ProMaster. All Ranger Design van ladder racks are constructed of heavy-duty rust-proof aluminum and are contractor proven tough. 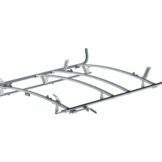 They use stainless steel mounting hardware and have an attractive powder coated white finish that ensures no corrosion over the lifetime of the rack. Additionally, they have an aerodynamic design that helps reduce wind noise and buffeting. A Ranger Design aluminum ladder rack is much lighter and longer lasting than steel ladder racks. Our van ladder racks are designed to fit a wide variety of commercial vehicles. To find the one that meets your needs and fits your vehicle check out one of our catalogs, or better yet call us at (800) 565-5321, one of our world class customer service specialists standing by to answer your call. You can also contact us or request a quote.